On January 7, 2011 pretrial hearing, three Conrad Murray women took the stand. The defense counsels seemed highly sensitive about the testimonies of these witnesses. @3:51 "So he is still married? WOW! He told me he was divorced"
Q. Ms Anding, in February of 2009, where were you employed? Q. What was your position? Q. Were you working in the restaurant portion? The lounge portion? Q. Which part of Sullivan’s Steakhouse did you work as a cocktail waitress? Q. 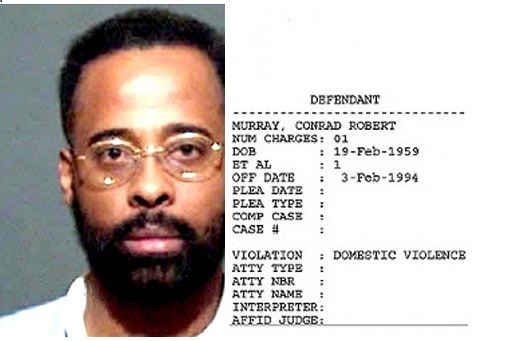 While working at Sullivan’s steakhouse, did you meet with Conrad Murray? Q. And Mr. Murray was a patron in the restaurant? Q. Did your meeting with Conrad Murray stand out in your mind? Q. Was there something significant about your meeting with Conrad Murray? Judge called a sidebar meeting….. Prosecutor Deborah Brazil: The witness testified that when she first met Conrad Murray, they struck up a conversation and she remembers him because he tipped her extremely well. The financial relationship they had started from the very first meeting. Q. From that first meeting of acquaintance with Dr Murray, did you see him after that? 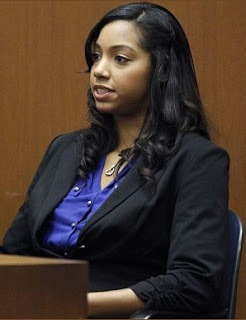 Ed Chernoff objected to almost every question throughout the testimonies of Sade Anding, Bridgette Morgan and Nicole Alvarez- women Conrad Murray was courting simultaneously while he was married. On May 23, 2009 Conrad Murray took Ms Anding out to eat and upon returning, he gave a check for $500. According to a motion filed by the prosecution, this check is representative of their relationship. Prosecution motion stated that Conrad Murray told Sade Anding that he was Michael's personal doctor, thus breaking patient/doctor confidentiality “for his own benefit. This is a stark contrast to his withholding of relevant patient information when it was most critical at the time of Michael Jackson’s death”. Before Bridgette Morgan’s testimony on June 07, 2011 the defense requested another sidebar meeting because they filed a motion. “Her involvement as an exotic dancer at various a variety of clubs in Vegas. That information, I am seeking to exclude because it was six years before the events in 2009” argued defense attorney, Joseph Low. “They met at a club and it is a social relationship. I don’t need to know the particulars of the club” said judge Michael Pastor. “I hear you addressing the club but again even characterizing it as a club…why they can’t they meet out of town? Can’t they meet in public? Why can’t it be social?” complained defense attorney, Joseph Low. Conrad Murray met Bridgette Morgan in 2003 at Cheetah's Club in Las Vegas. The two dated until 2005, after which time they exchanged occasional phone calls. The two had lunch in Los Angeles 3 weeks before Michael’s death and during lunch, Murray disclosed to Ms Morgan that he was Michael Jackson’s personal doctor. “Conrad Murray had a pattern of informing selected people about his working relationship with Michael Jackson. He had a pattern of revealing confidential information when it suited him but he was unwilling to reveal patient information at the most critical time” stated the motion filed by prosecutors. During the aforementioned lunch date, Conrad Murray offered to buy a plane ticket to Las Vegas for Ms Morgan’s birthday. To follow up on this offer, Ms Morgan called Murray twice on the morning of June 25, 2009. “Dr Murray put no limitations as to the time period when his acquaintances could call him. He was receiving personal phone calls during the hours when he was supposed to be completely focused on the care of Mr. Jackson” declared the prosecution motion. Yet another sidebar meeting before Nicole Alvarez’s testimony on January 7, 2011 because the defense feels that how and where she met with Conrad Murray is irrelevant to the Trial. The judge allowed her to be questioned on the nature of the relationship considering propofol orders were delivered to her apartment. Nicole Alvarez and Conrad Murray have a son together. Murray was staying with Alvarez's Santa Monica apartment when he would fly in to LA to "treat" Michael. She refused to cooperate with the police and she was a very difficult witness during the preliminary Trial. She mostly replied “I don’t recall” and she kept asking the prosecutor to repeat questions as if to stall for time or just to annoy prosecutor Brazil. At some point, she had Ms. Brazil repeat a question 3 times. The judge then interjected "okay, we've got to pay attention because we are repeating and repeating and repeating"
Q. Miss Alvarez, when did you meet Conrad Murray? Q. Specifically where in Las Vegas? Q. What type of club? Nicole Alvarez met Conrad Murray in Crazy Horse Too. She danced for Murray in a private VIP lounge and Murray paid her $3500. He continued seeing Alvarez once or twice a month, he regularly paid her $2700 per month rent for her Santa Monica apartment. that he had six other children? while you were having a relationship with him? Nicole Alvarez’s response to a later question reveals that she DID know that Conrad Murray was married. Q. Where would you consider his dwelling in April 2009 to be? Conrad Murray’s relationship with Nicole Alvarez is notable because he and his wife, Dr. Blanche Bonnick Murray had left their practices in San Diego and moved to Las Vegas to escape a similar situation with Nenita Malibiran, with whom Conrad Murray had an affair with and had a son out of wedlock. I know he was intrigued with me" (she was studying to be a chiropractic assistant). The day the two met, Conrad Murray paid her $1100 for her services. On June 25, 2009 at 8:30AM Conrad Murray sent a text to Michelle Bella who told the police "I mean his schedule was obviously, you know -- I know that he was like up all hours because of his work so when -- so when he called, you know, he sounded tired and he was like I'm gonna get some sleep"
On June 16, 2009 Conrad Murray left a voice message for Michelle Bella telling her that he was currently working as an “exclusive medical director” for a person whose name he mentioned in a prior text message. Prior to this voice message, Conrad Murray texted Ms Bella that he was working as Michael Jackson’s doctor. “Similar to the evidence regarding Dr. Murray’s disclosure to Sade Anding, this evidence shows Dr. Murray’s obvious willingness to breach patient/doctor privilege for his own benefit. This is a stark contrast to his withholding of relevant patient information when it was most critical at the time of Michael Jackson’s death” stated prosecution motion. On April 7, 2011 the defense team filed a motion to “exclude evidence of strip clubs”. Conrad Murray's first wife. They were married in Harris County, Texas on October 17, 1984. Their got divorced on August 26, 1988 in Dallas County, Texas. She is now a pharmacist living in New Jersey. While married to Zufan Tesfai, Conrad Murray had an affair with and had a daughter with Patricia Mitchell. Murray's girlfriend and mother to his first child. They met while Conrad Murray was married to Zufan Tesfai. In November 1985, Patricia Mitchell had Murray arrested for "Fraudulent Breach of Trust,” meaning she accused him of stealing or misusing money or property entrusted to him. Murray who was a medical student in Nashville at the time posted a $2,000 bond the next day and the case was dismissed in January 1986. The marriage bliss didn’t last long. Conrad Murray can’t seem to keep it in his pants! Nenita Malibiran is a Hispanic-American nurse who met Murray when they both worked at Sharp Memorial Hospital in San Diego. Both Nenita and Conrad were married to other people when they were dating. They have a son together. She now lives in the Sacramento suburb of El Dorado Hills with her now 13 year old son. In 1999, Nenita Malibiran and Conrad Murray fought in court over child support and he acknowledged in a deposition that he had a history of fathering children and then leaving their mothers. During the trial, Conrad Murray cried on the stand about missing his son, even though he had made little attempt to visit him. After winning this case, Malibiran had to sue Conrad Murray several more times for failing to pay child support. Conrad Murray didn’t pay his children support 1999-2007. He was sentenced 25 days imprisonment in 2007 and 25 days imprisonment in April 2009. On both occasions, it was for nonpayment of child support for his son with Nenita Malibiran. On both occasions, Murray evaded prison by obtaining a stay and eventually paying up.